Many of us may act against our own self interests. This can be an everyday occurrence or a rarity but when we do we are self-sabotaging. Self sabotaging behavior that interferes with us reaching our goals. This can mean self harm like cutting or substance abuse. It can also be other behaviors that limit or undermine our success. There are many different reasons we may self sabotage. Each reason can also be very complex. Commonly the reasons have one thing in common, they are a symptom of low self worth. When we feel we are unworthy we are unmotivated to reach our goals. We may procrastinate, back out of situations we think are tough, or simply avoid situations because we fear failure, we feel we are unable or unworthy. How do we know if we are self sabotaging? 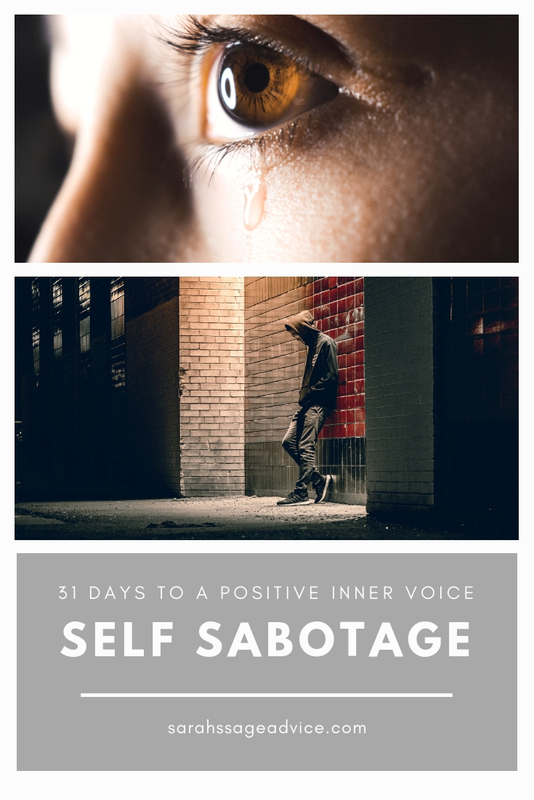 There are many signs of self sabotage. Take a look and pay close attention to your own actions. Self criticism is when we are constantly negative about ourselves. When we do so we harm our self esteem and self worth. We lose motivation and a want to reach our dreams and goals. When we are unmotivated we may do many self sabotaging behaviors that harm our chances to reach those goals. For example, we may have an interview scheduled, but call and cancel because we fear sounding unprofessional, we fear not getting the job or we feel we are incapable we’d never get it anyway. When we are picking arguments we are harming relationships with those around us. When it’s not necessary we may pick an argument simply because we’re in a bad mood. It could be that we feel such negativity we want others to feel it too. This is a huge reason bullies have such behavior. Most often they are depressed, sad, angry and feel like making others feel the same. When we procrastinate we are self sabotaging our ability to produce quality work. Often times when we procrastinate we do not finish projects completely. I had a bad habit of doing this in school. It arose as “I’m never going to get an A” so when I thought that I’d procrastinate writing papers or studying for tests because I felt there was no point to try hard. But perhaps had I put more work into it I could have done better work. Overindulging can be self sabotaging in several different ways. We could overindulge in drugs or alcohol, becoming dependent and unable to live everyday life without that substance. We could overindulge in food, gaining weight, becoming more unhealthy, losing motivation, self confidence, and lowering our self esteem. We could even overindulge in something seemingly positive, like working out. What if you worked out every waking minute, leaving no time for friendships, for relaxation, for relationships, etc. This can be seen a lot with people that have been hurt before. Whether it was an abusive relationship or just had your heart broken, it can be hard to give yourself to another person and risk the same pain. In an effort to avoid that pain we run at the first glance of a relationship getting serious or we chase it away by creating reasons for them to break up with you. How do we change self sabotaging behavior? Soooooo good 😭 I’m wrecked! Pinning this so I have it as a reminder! This is what I’m most guilty of myself.